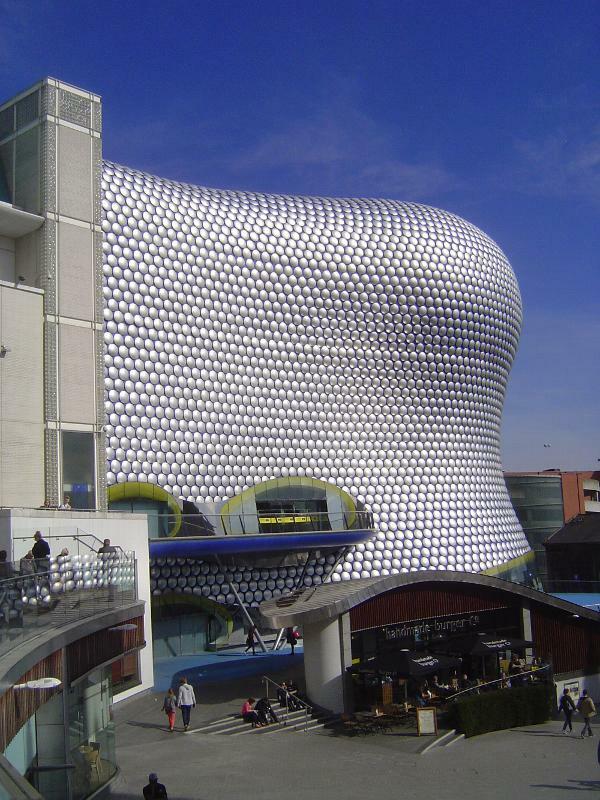 Birmingham grew seven-fold in the 19th century, from 73,000 people in 1801 to 523,000 in 1901. How come? 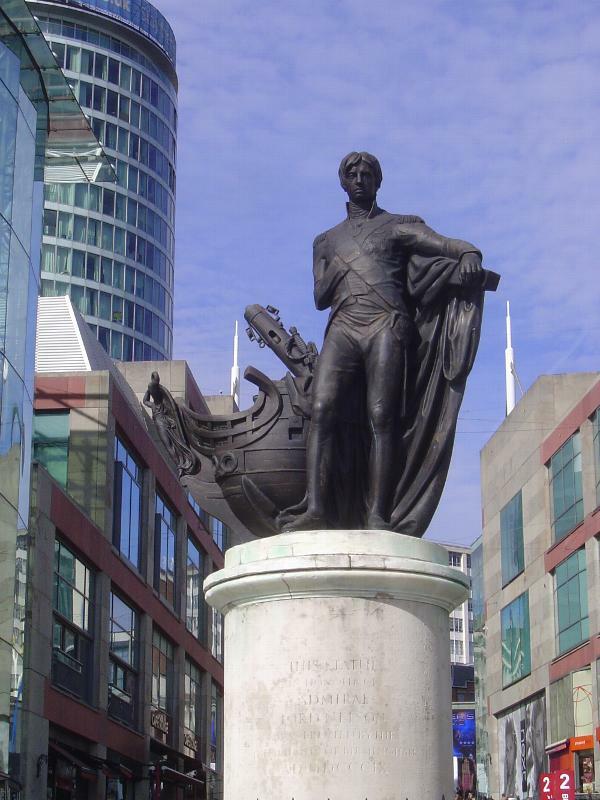 Charles Pye answered the question this way in 1818: Birmingham "is distinguished in the commercial annals of Britain, for a spirit of enterprize and persevering industry. Its inhabitants are ever on the alert, and continually inventing some new articles for traffic, or making improvement in others, that have been introduced in foreign countries and by their superior skill, aided by machinery, are enabled to bring into the foreign market an endless variety of manufactured goods...." See Pye's Description of Modern Birmingham, 1820. 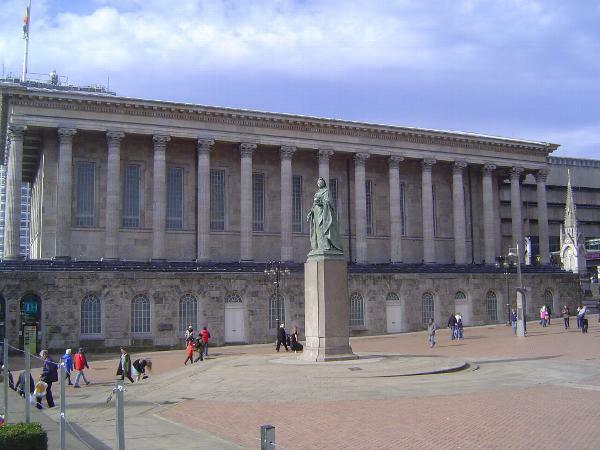 A bit of urban bragging, this is the Birmingham Town Hall, begun in 1832 and designed to seat 3,000 ratepayers. The architects were Joseph Hansom and Edward Welch, though how much credit they deserve depends on how many points you deduct for copying classical Rome's temple of Castor and Pollux. Hansom had more than points deducted: he was bankrupted after guaranteeing to build the thing for 17,000 pounds. Quarrying and transporting the stone boosted the cost to 25,000. Such is the capitalist's hell: dare to risk, only to be ruined. The building was the site of the premier of Mendelssohn's Elijah. Dickens gave readings here. Bob Dylan played here. Onward and upward. Another view, with the widow standing apple in hand. 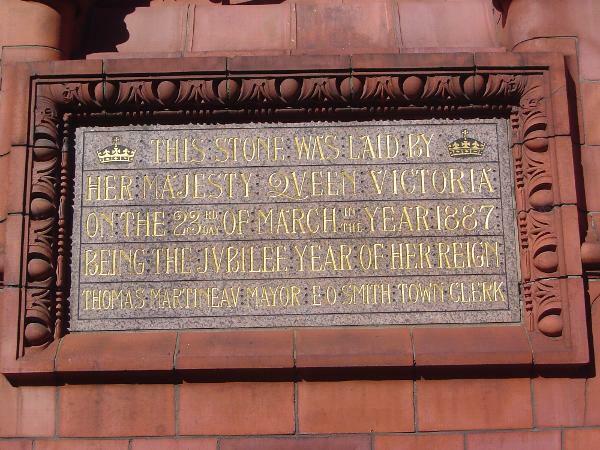 The sculptor was Thomas Brock, and the statue was unveiled 12 days before Victoria died. On the far right is the Gothic memorial to Joseph Chamberlain, the mayor who went on to grander things as Victoria's Secretary of State for the Colonies. 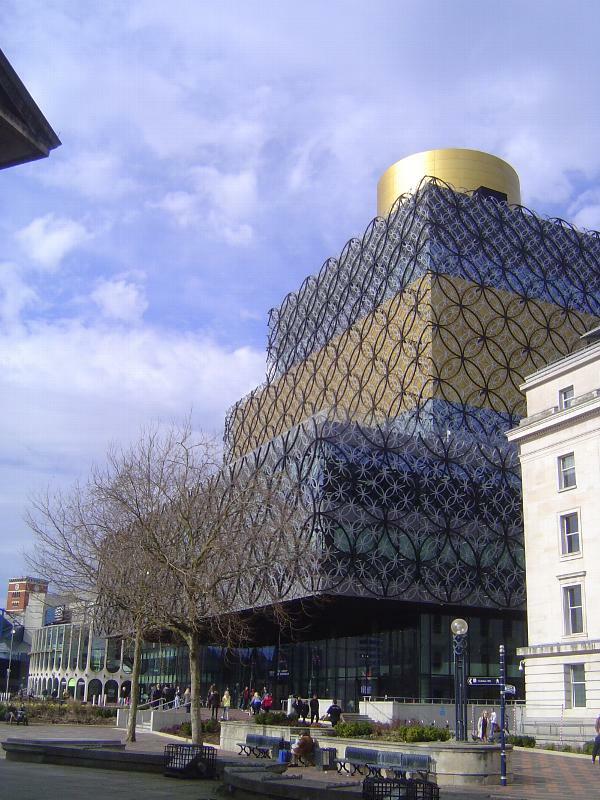 Beyond the memorial is the grim central library, which a loose-lipped Prince of Wales famously said looked more like a place to burn books than read them. Do you think he has a ghostwriter, or is he that sharp-tongued himself? 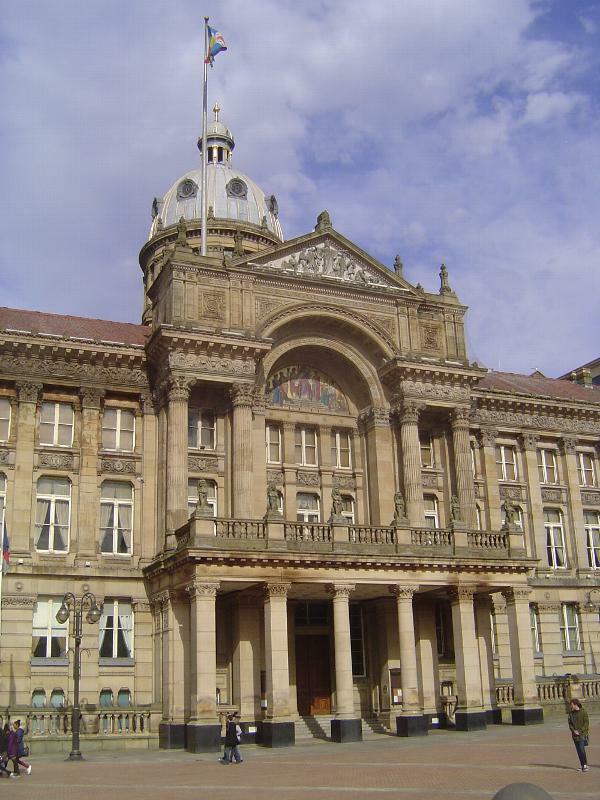 Facing the same Victoria Square, the Council House was built about 40 years after the Town Hall to a design by Yeoville Thomason. 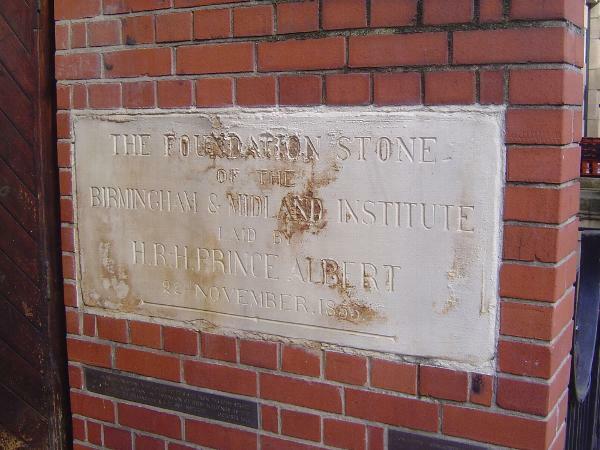 Chamberlain laid the foundation stone. 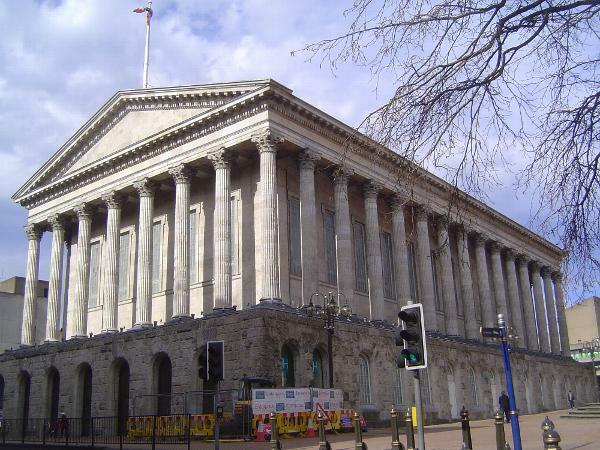 The pediment has Britannia rewarding the manufacturers of Birmingham, while the mosaic below personifies Science, Art, Liberty, Municipality, Law, Commerce, and Industry. Busy, busy; there's a world to build. A bit more of the building. Bored? No problem: at the far right, just under the cylindrical or rolled corner there's a Starbucks. Like stairs? 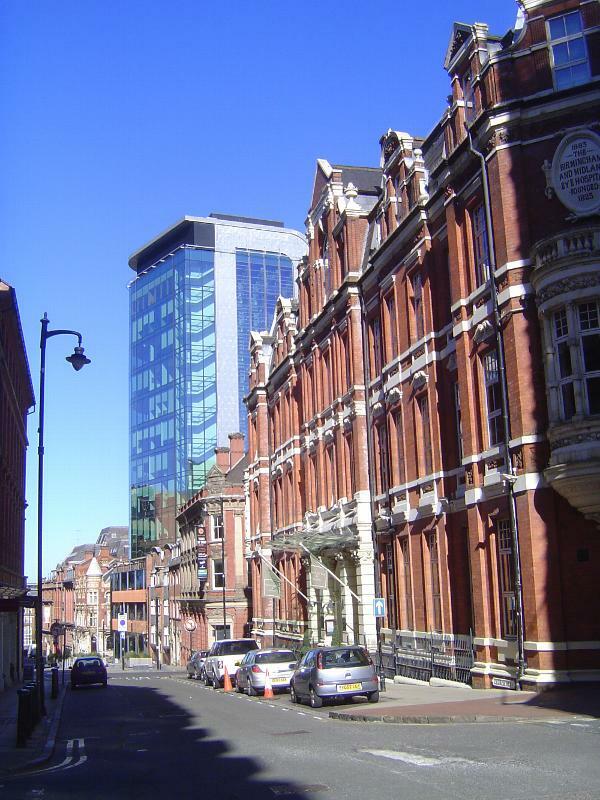 The tower on the right is Edmund House (from Edmund Street). 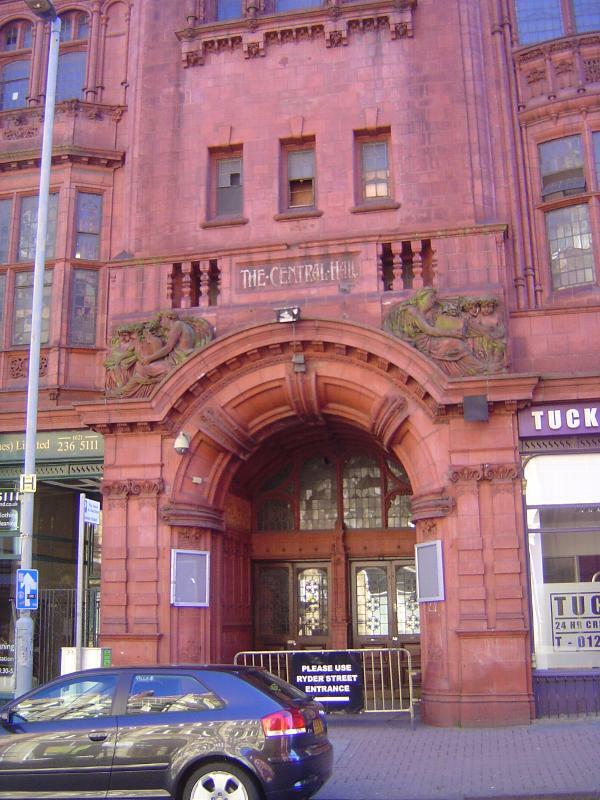 It sold in 2013 for eight million pounds and was slated to be refurbished. See? The Great Mirror isn't all about the past. Oops. More past. 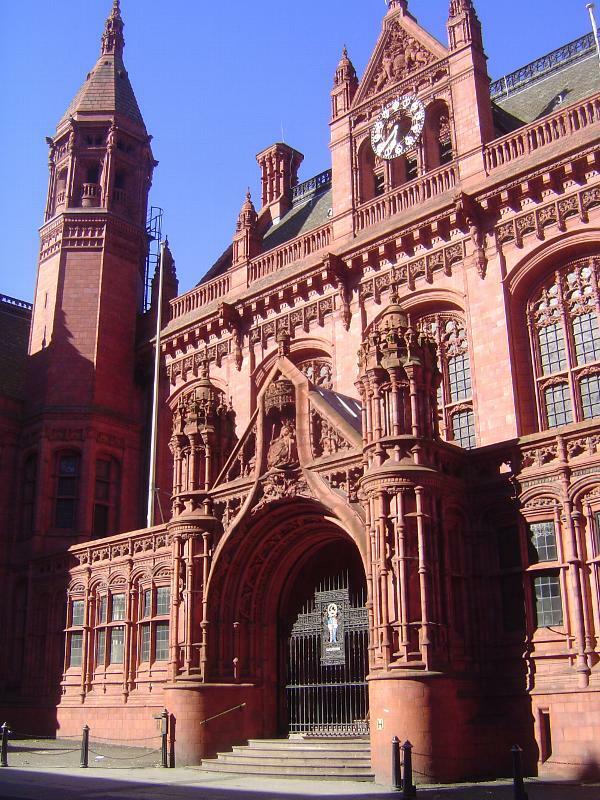 These are the spectacular Victoria Law Courts, designed by the partnership of Ingress Bell and Aston Webb. (Webb did the much better known but less interesting facade of Buckingham Palace). The material is terracotta, cast not carved. That's not its only advantage over stone: terracotta resists soot. The style is a blend of Gothic and French Renaissance. 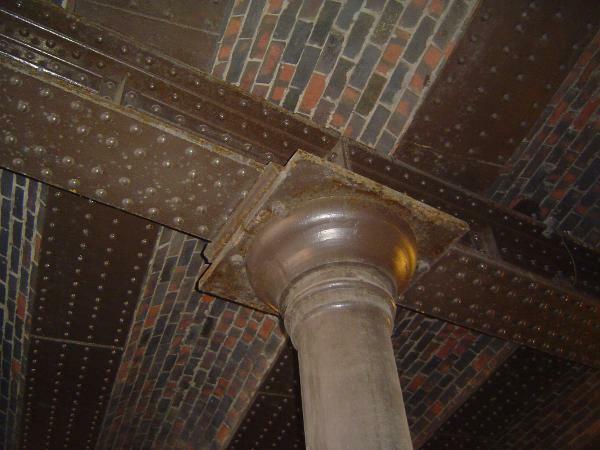 For more, see Andy Foster's very useful Birmingham, 2005. What grabs your eye? Not the open-air market, plunged in shadow. Not the city's old church, St. Martin in the Bull Ring. Inevitably, it's "the blob," a Selfridge's store. Underneath the amoeba casing there's an ordinary rectangular block. Speaking of churches, here's St. Philip's, built as a church but clasified as a cathedral since 1905, when a new diocese was created. Most of the church was finished by 1715, though the chancel at this end was added late in the 19th century. The architect was Thomas Archer, Queen Anne's gentleman of the bed chamber (whatever that means) and "the only English architect of his day who knew the Italy of Bernini and Borromini." You have to love architect-speak: the church has a "tremendous bell-stage with four deeply concave sides running to paired Corinthian piers set at the diagonals...." Don't pat the stones to feel their age: all the visible stone is from the 19th or 20th centuries, though carefully copied from what was used earlier. 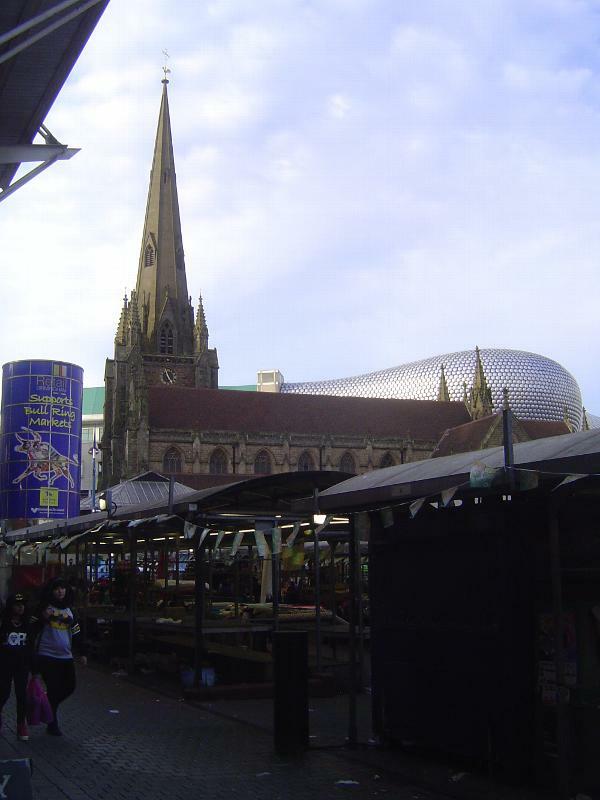 See Andy Foster's Birmingham: Pevsner City Guide, p. 42. St. Thomas, built in 1829, was bombed in 1941, which left only the west end, minus its ball and cross. 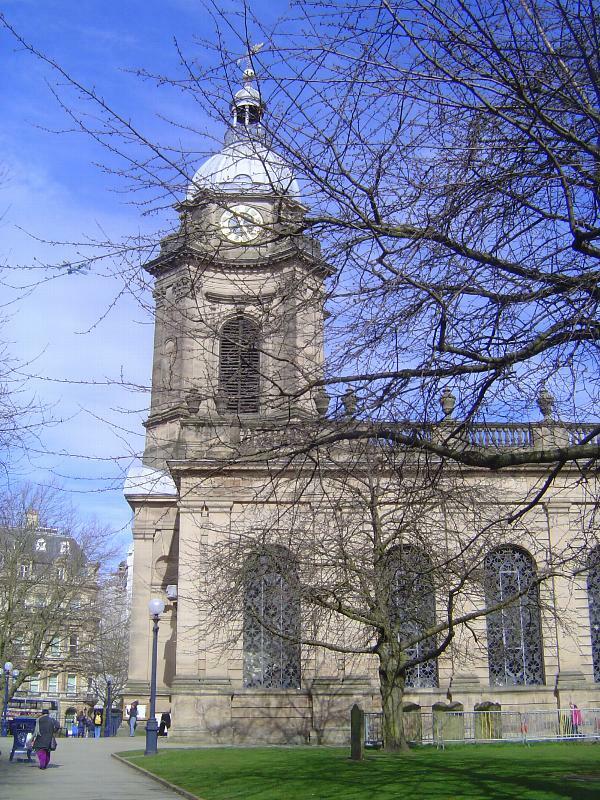 George Yates, in his Historical and Descriptive Sketch of Birmingham, 1830, writes: "The third new Church erected in Birmingham by his Majesty's Commissioners, out of the Parliamentary Grant, is situate at Holloway-head, a pleasant eminence.... 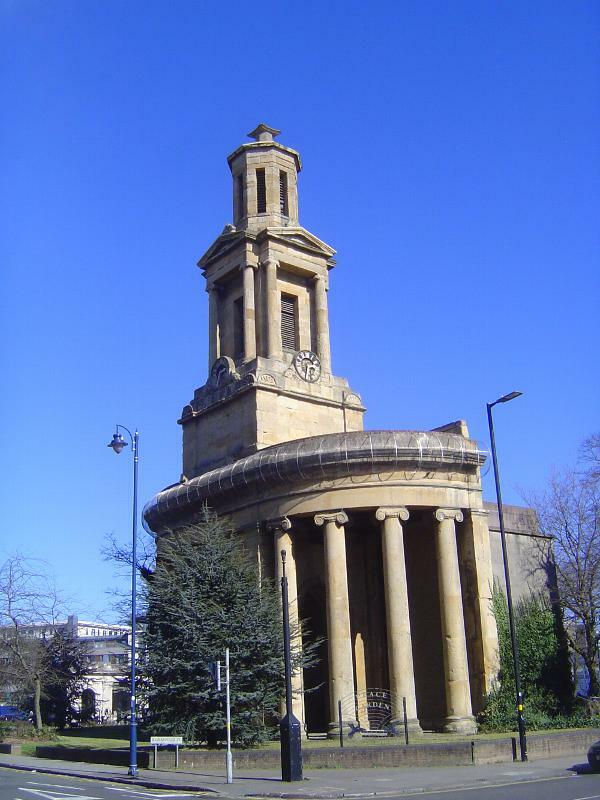 The first stone was laid by the Lord Bishop of the Diocese on the 2d of October, 1826, and the edifice was consecrated by his Lordship on the 22d of October, 1829.... Messrs. Rickman and Hutchinson were the architects of this church, which is a large and handsome structure of the Grecian style, with two noble Ionic circular porticoes at the western end, between which rises a lofty steeple, sustained by massive piers, the arches of which are open." The church sat 2,125 but now opens onto a "peace garden" established in the 1990s. 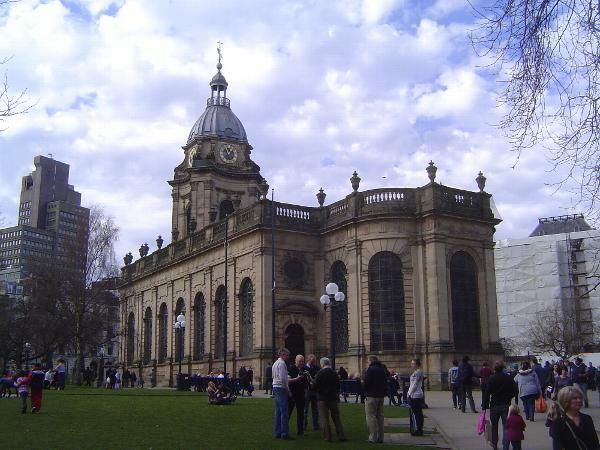 Another of the churches built after the Birmingham Churches Act of 1772. 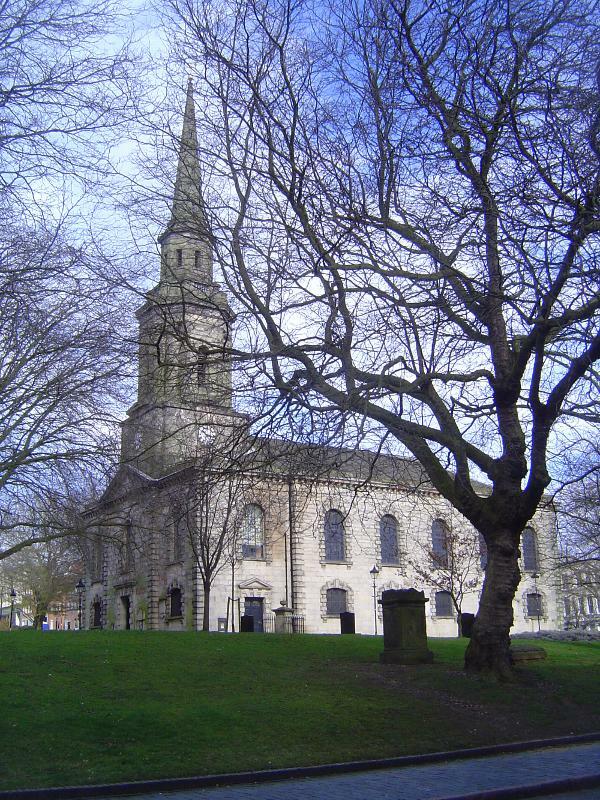 Foster writes that this one, St. Paul's, was old-fashioned even in 1780, when it was built as a "pattern book church of the period, heavily dependent on James Gibb's St Martin-in-the-Fields" (p. 162). The upper part of the tower and spire were added in 1923, and the roof was replaced after wartime bombing, but the rest of the building is intact, the last of the city's 18th century churches. The church sits in a large square given by Charles Colmore, who owned the surrounding property and hoped to profit from the church's presence. 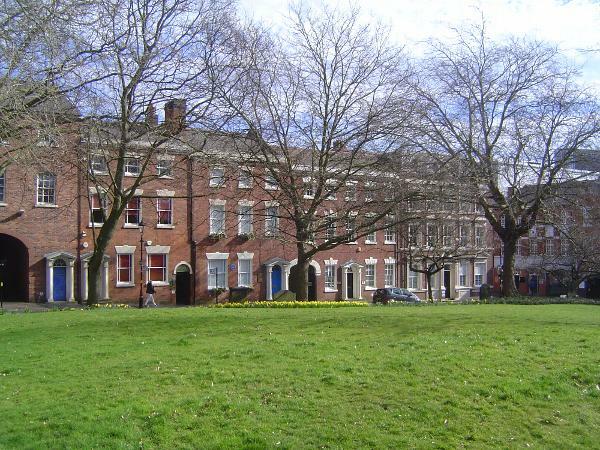 The square is said to be the city's only true Georgian square, neatly rimmed with three story houses. The sign is of cast iron. It's heavy and of a type appearing on many street corners in the city. One more church, before we try something different. 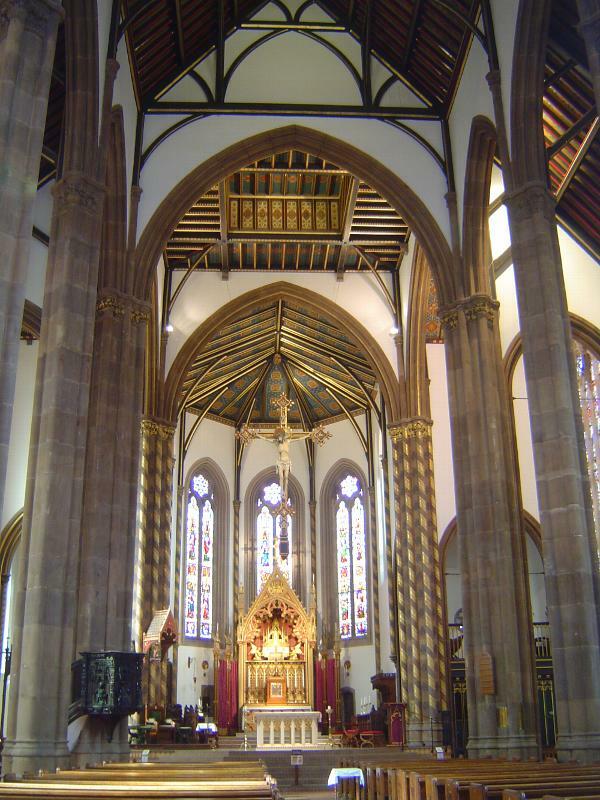 This is Augustus Pugin's St. Chad's Cathedral, from 1840. Foster calls it a "landmark in Gothic Revival" (p. 47), and if it looks austere that may be because the budget was limited to 20,000 pounds. 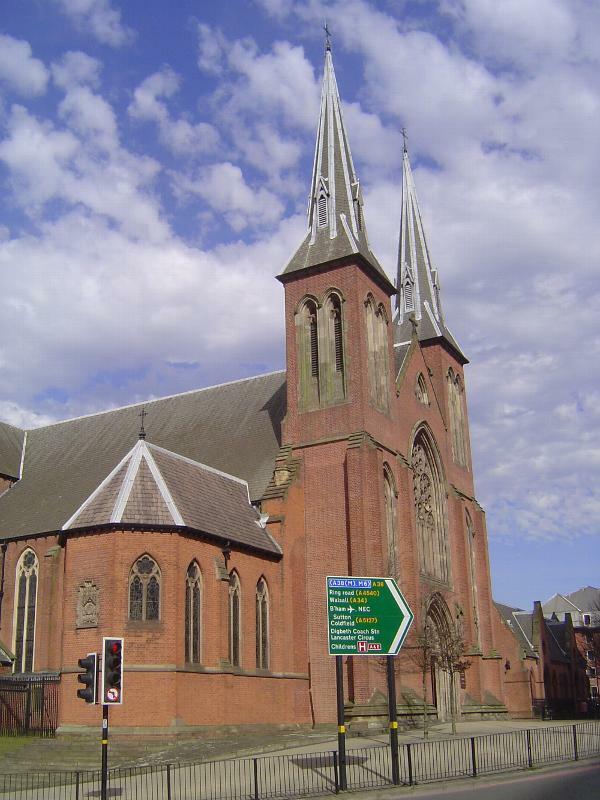 This was the first Catholic cathedral built in England since the Reformation. 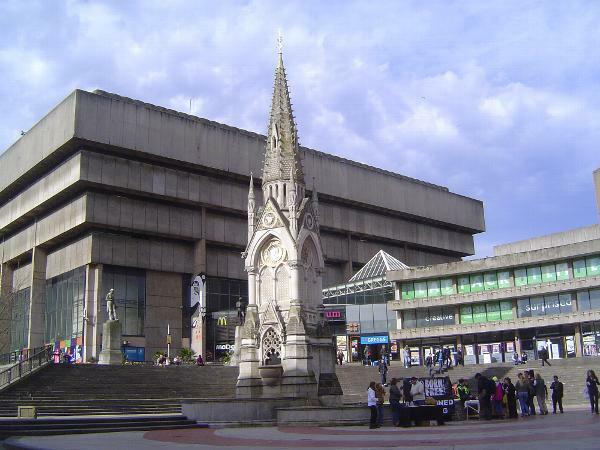 Not that Pugin especially wanted it here in Birmingham, which he called "that most detestable of detestable places." If only he could see the arterial road that now runs in front of his church. 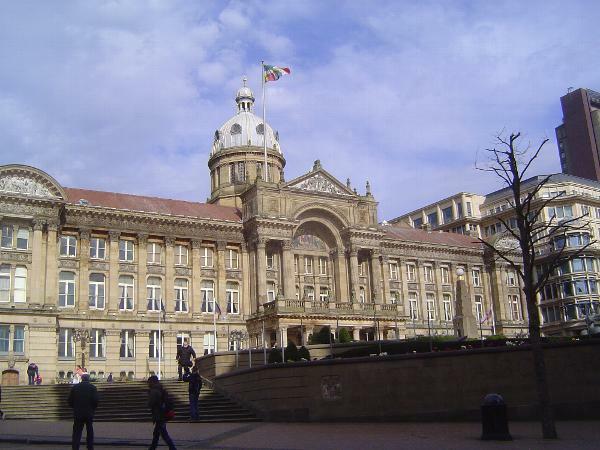 It was the work of Charles Manzoni, Birmingham's city engineer and a no-nonsense guy. "I have never been very certain," Manzoni wrote just after World War II, "as to the value of tangible links with the past. They are often more sentimental than valuable.... As for future generations, I think they will be better occupied by applying their thoughts and energies to forging ahead, rather than looking backward." Pugin did the high altar, too, as well as the "daringly thin" roof timbers. 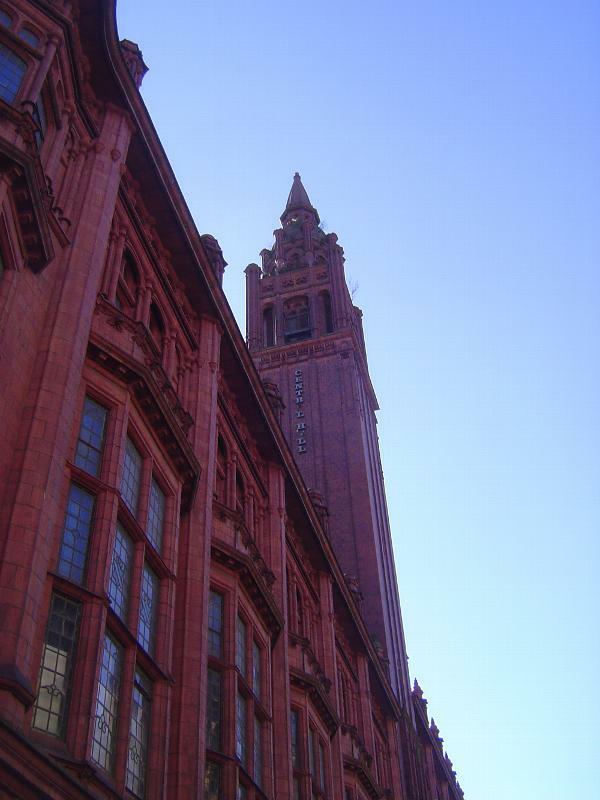 The sign on the tower tries to say Central Hall. That would be be the Methodist Central Hall. Ewen and J. Alfred Harper built the place to seat 2,000 people. Completed in 1903, it replaced an older hall half the size. 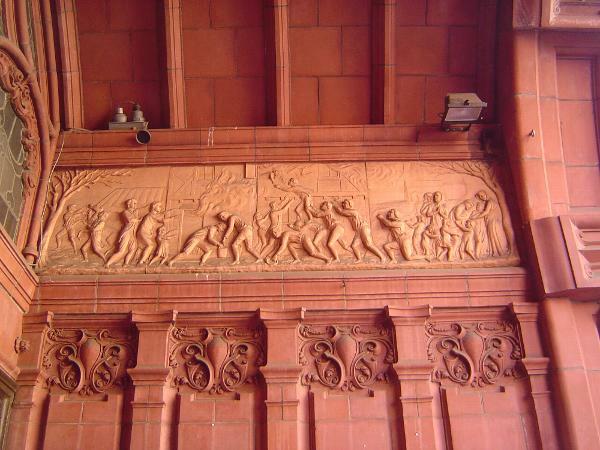 It's terracotta, like the Victoria Law Courts, which are across the street. The main entrance, once. The sculptures show the instruction of cherubs. The entrance is decorated with scenes from the life of John Wesley. The event shown here is a rectory fire in 1709. Here's Wikipedia on the incident: "Some time after 11:00 p.m., the rectory roof caught on fire. Sparks falling on the children’s beds and cries of "fire" from the street roused the Wesleys who managed to shepherd all their children out of the house except for John who was left stranded on the second floor. With stairs aflame and the roof about to collapse, Wesley was lifted out of the second floor window by a parishioner standing on another man’s shoulders. Wesley later quoted Zechariah 3:2, "a brand plucked from the burning," to describe the incident. His childhood deliverance subsequently became part of the Wesley legend, attesting to his special destiny and extraordinary work." Remember that Birmingham had 70,000 people in 1800. A century earlier it had had only 15,000. That's a partial explanation for why there are few pre-19th century buildings. 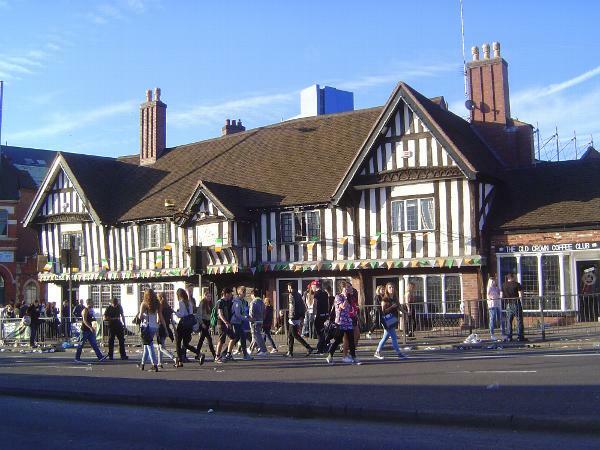 Here's one, the Old Crown Inn, the "only complete surviving medieval building of Birmingham," according to Foster. It dates from the late 1400s and was the Guildhall and School of the Guild of St John the Baptist of Deritent. Unruly pedestrians, you say? We'll take care of that! 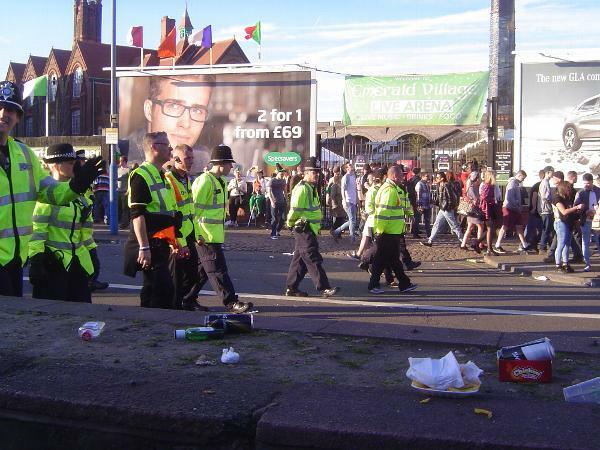 A line of police clears the street after St. Patrick's Day festivities, 2014. 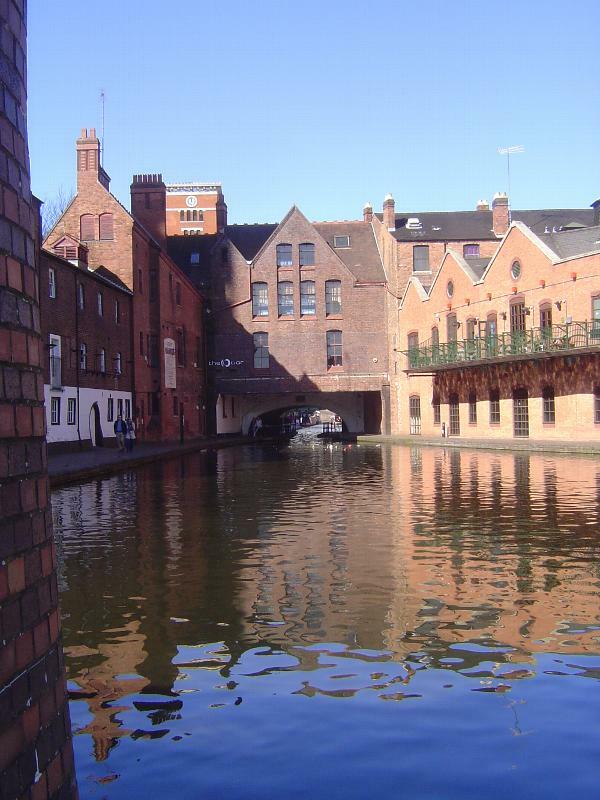 Birmingham was a junction on England's canal network. 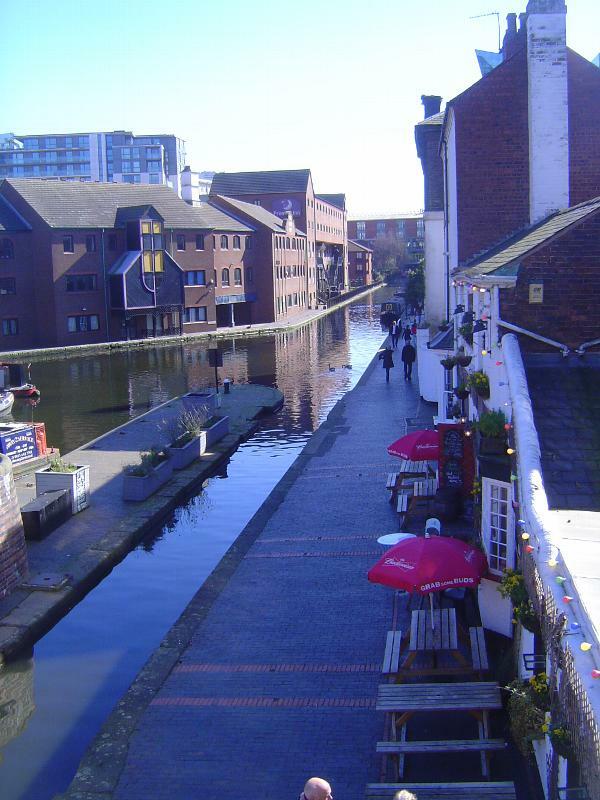 The view here is of the Birmingham Canal at the Gas Street Basin. The massive tunnel is actually the Broad Street bridge. Charles Pye reminds us that it once was much more. Writing about 1820, he refers to "a regular communication by water between this town, London, Liverpool, Manchester, and Bristol; to the three former places, goods are delivered on the fourth day, upon a certainty; there being relays of horses stationed every fifteen miles." He continues: "The trade of this town has within the last fifteen years increased in an astonishing manner; for in the year 1803, six weekly boats were sufficient to convey all the merchandize to and from this town to Manchester and Liverpool, but at the present time, there are at least twenty boats weekly employed in that trade." 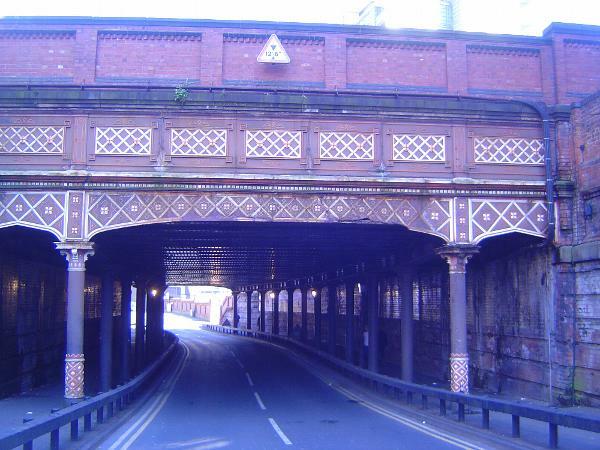 Here's the massive yet decorous cast-iron aqueduct of the Worcester and Birmingham Canal as it crosses Holliday Street. The aqueduct is surprisingly late: 1870. The construction bears comparison with the cyclopean warehouses at the Liverpool docks. 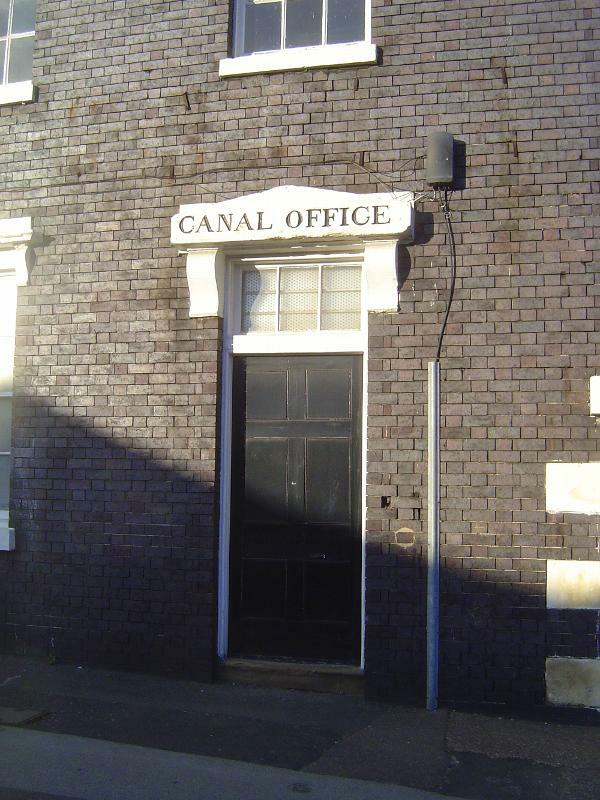 Here, on Fazeley Street, is the office built in 1844 for the same W and B Canal. Freight companies needed warehouse space. The company that built this warehouse, next to the now-filled Warwick and Birmingham Basin, stayed in business until 1947. 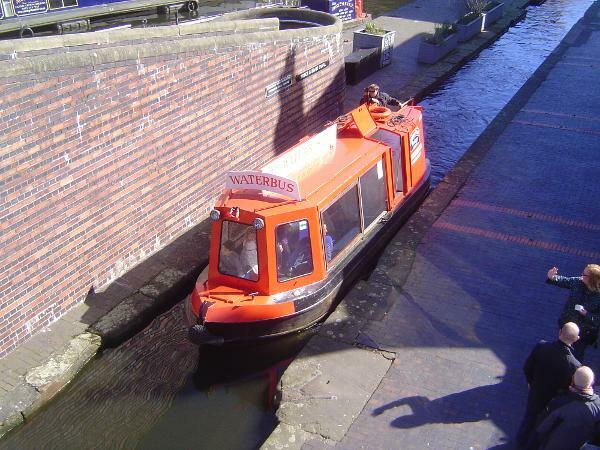 A more genteel use has since been found for the canals. Railways gradually strangled the canals. 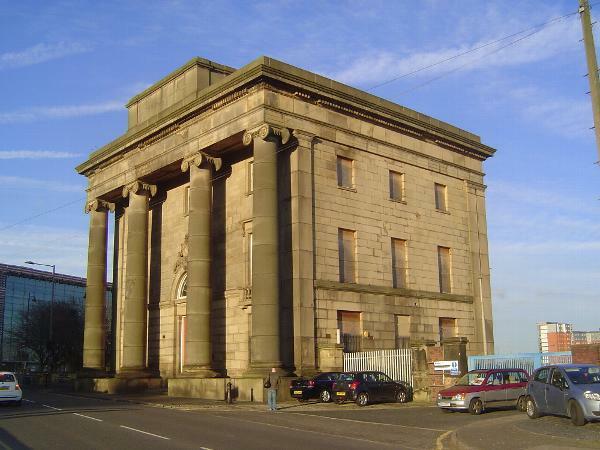 Here's the Curzon Street station of the London and Birmingham Railroad. 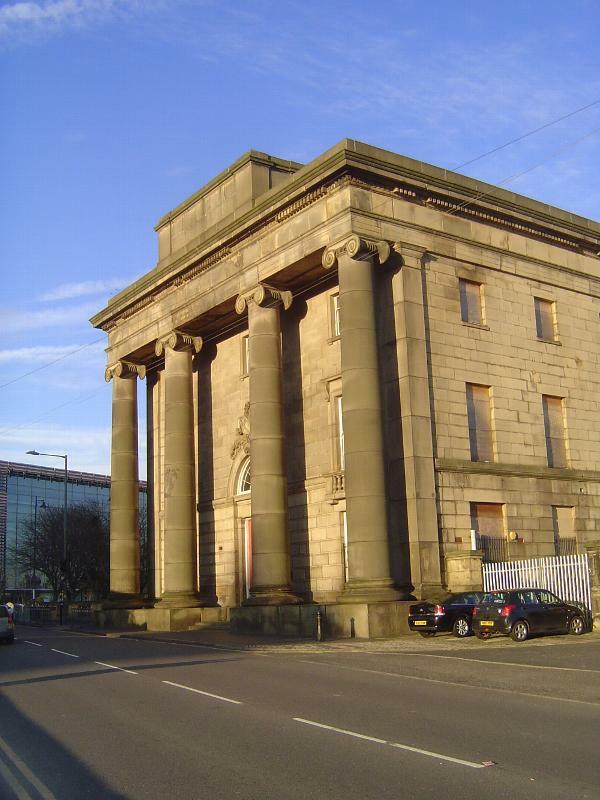 Superceded in 1854 by the New Street station, itself now demolished, the Curzon Street station was a warehouse office until 1966. Empty since then, it's considered the world's oldest monumental railway station. You want to know when it was built? Just ask: 1837. The architect, P.C. Hardwick, also designed the long-demolished Euston Arch at the London end of the line. What to do with this thing now? 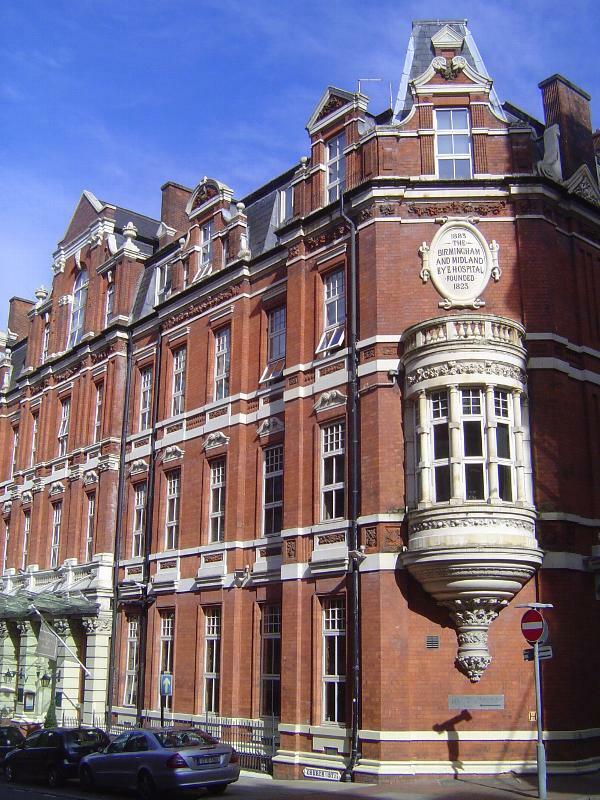 A scheme to convert the building to house the Royal College of Organists was abandoned in 2005; since then, there's been talk of incorporating the structure into the terminal of a new high-speed rail line. 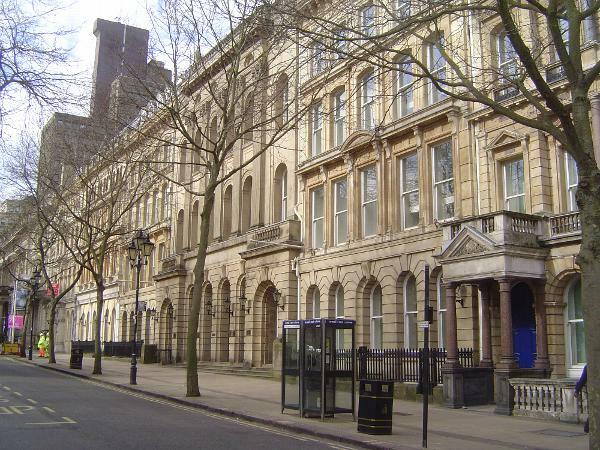 Industrial prosperity brought the need for office space, as in this lineup on Colmore Row. 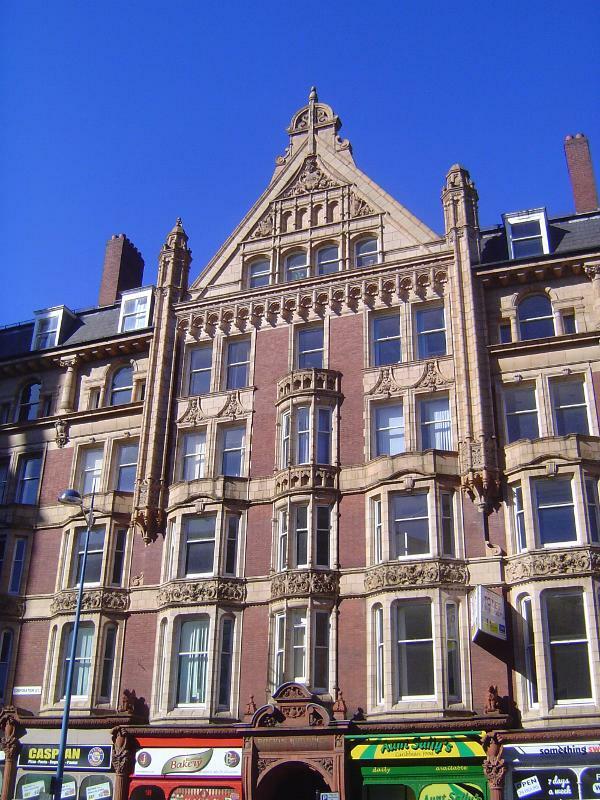 The windows look out on the city's cathedral and are only a three-minute walk from Victoria Square. 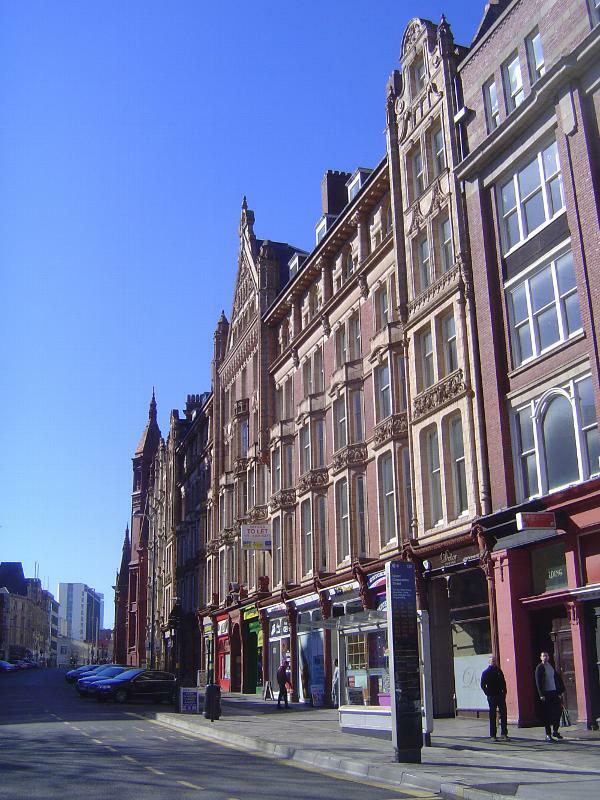 Close as it is to the city center, the area was only built up after the Colmore Act of 1746. 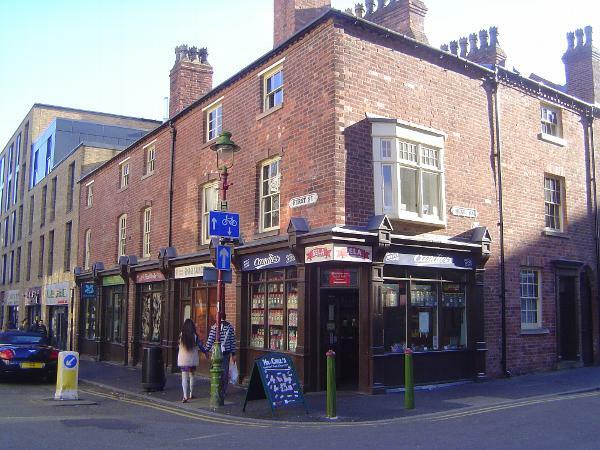 The owners of the buildings of that time had only a leasehold, which expired in 1869. The buildings standing today were added then. More of a sameness? Variation without a difference? 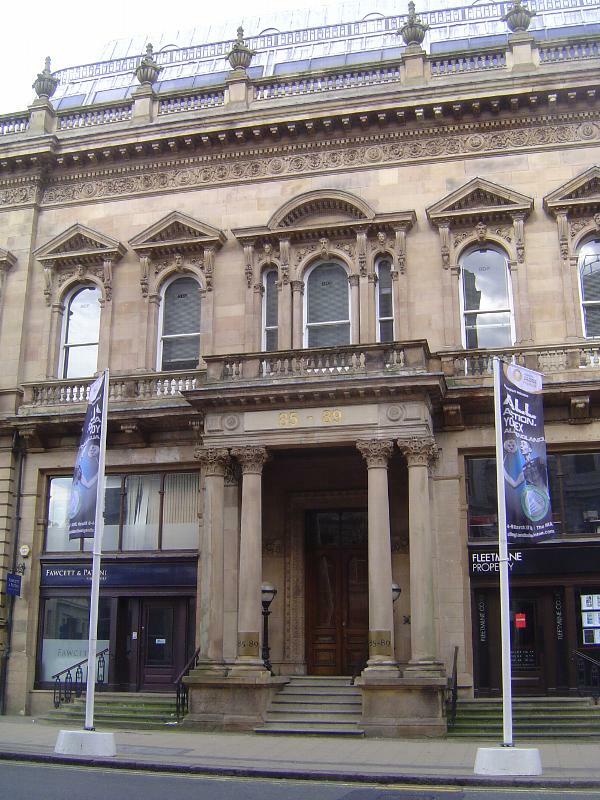 The former Midland Bank building, from 1869. Now a Waterston's bookstore. A later generation went red. 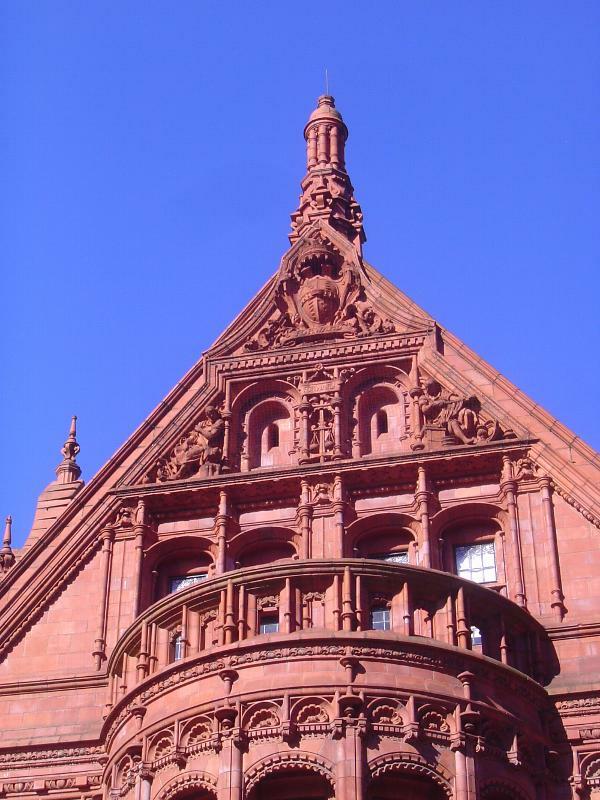 Here, close to the Victoria Law Courts and Central Hall, is the Ruskin Building, faced with terracotta. 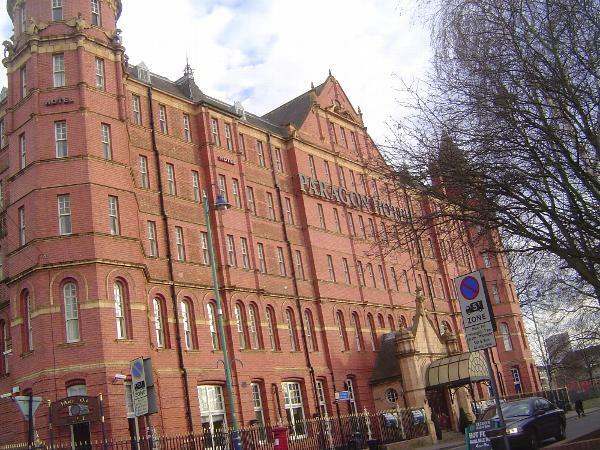 The building was designed by the same Ewen and J. Alfred Harper who at the same time were building the Central Hall across the street. 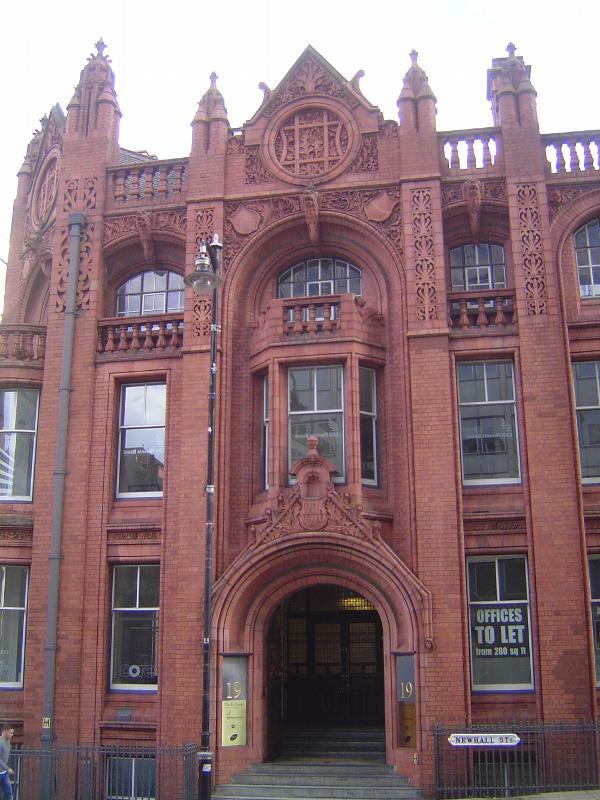 The building retains its original iron-pillar shop fronts. Terra cotta on parade, in this case dressing a commercial building from 1896. 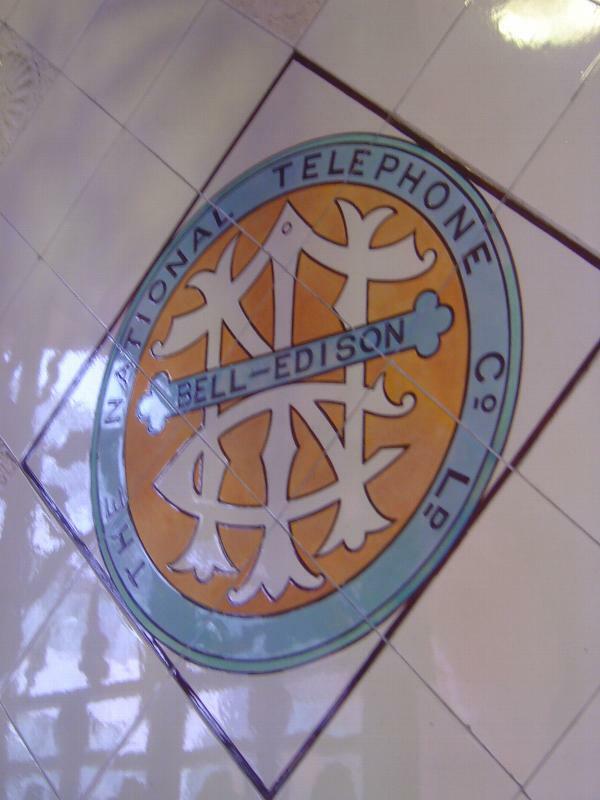 The architect was Frederick Martin; the client, the National Telephone Company. Logo in the building's entrance. 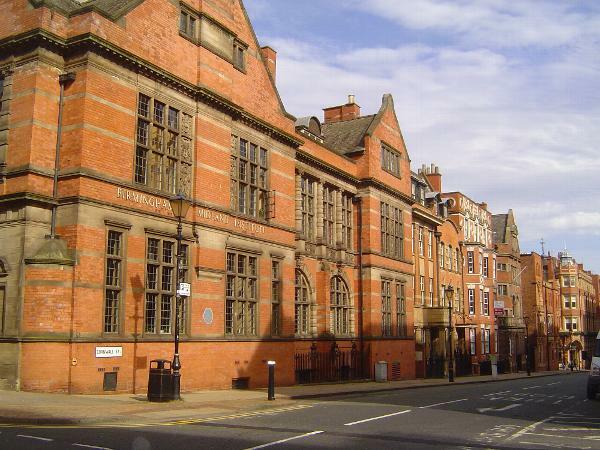 The city's wealth spilled over into cultural institutions including this, the School of Art, opened in 1885. 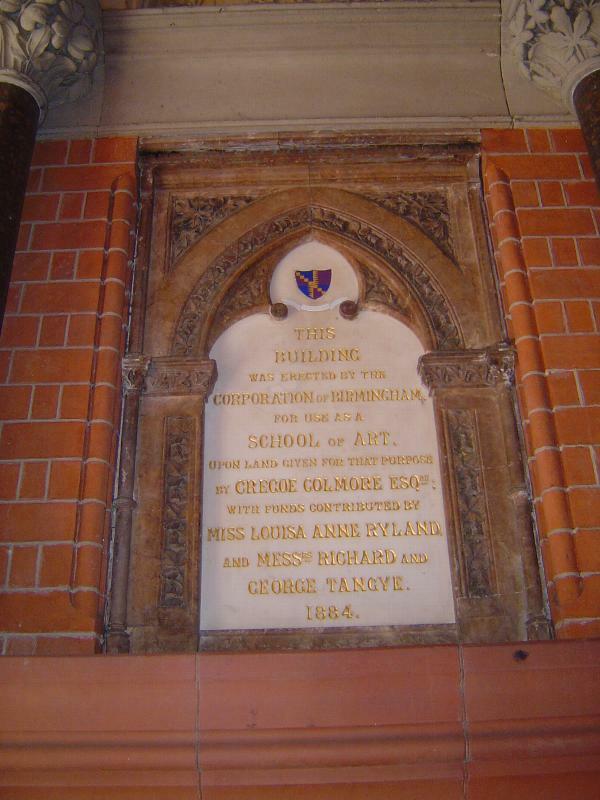 The land had been donated for this purpose by one of the locally ubiquitous Colmores, but the building was paid for by the Tangye brothers, owners of a company that manufactured heavy-duty hydraulic equipment, and by Louisa Ryland, heiress to an industrial fortune. The architect was J.H. Chamberlain, a Ruskinian, a professor at Queen's College, and an early preservationist, active in saving the medieval Old Crown. Want to make a religion of art? Then you need a school like a church. You also need lots of light in the studios. 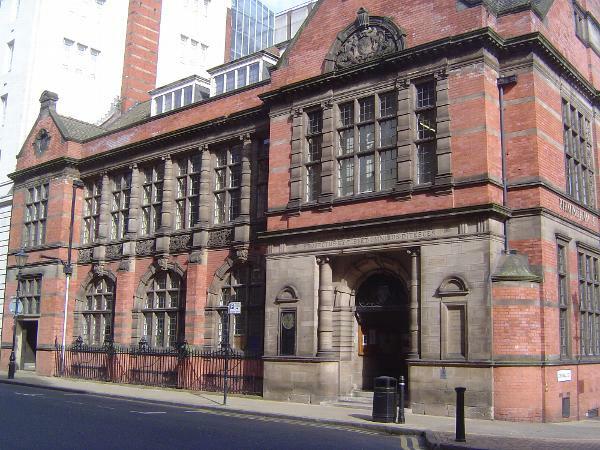 You can see the seam separating the original building (the last five bays) from an 11-bay extension added in the 1890s, along with blue Doulton-tile lilies and sunflowers. 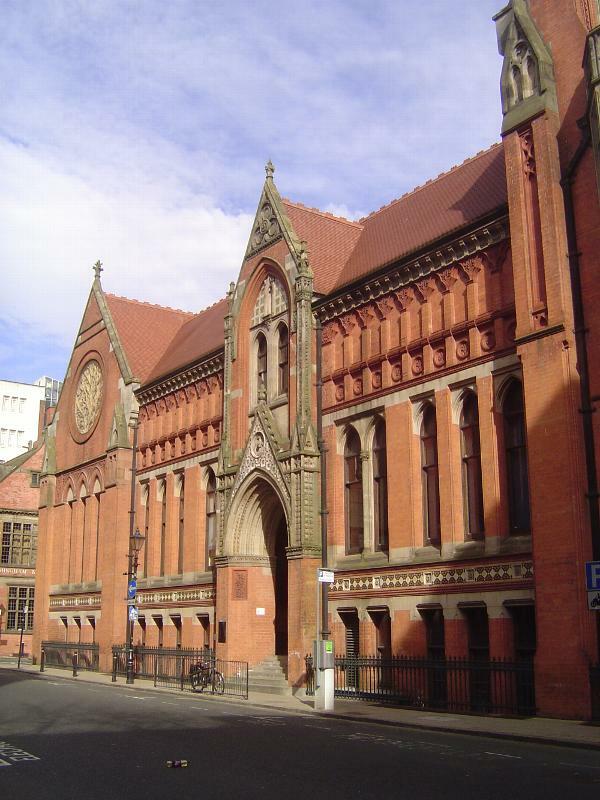 Next door: the Birmingham Midland Institute was established in 1854 "for the Diffusion and Advancement of Science, Literature and Art amongst all Classes of Persons resident in Birmingham and the Midland Counties." Another face, with a Latin inscription: Ad Mercaturam Bonarum Artium Profectus, et tibi et omnibus ditesces. Here's one possible translation: Having advanced to the trade of the noble sciences, you enrich both yourself and everyone else. It does seem like the kind of project he would have liked. 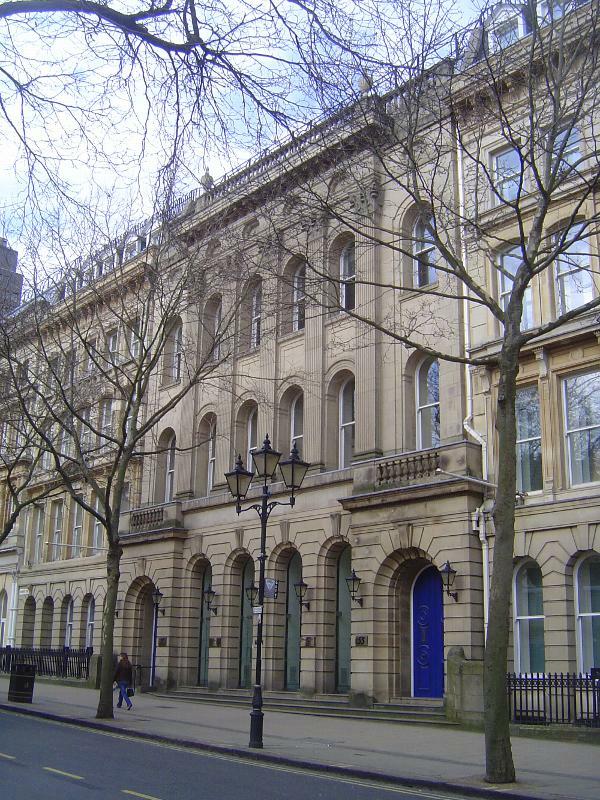 Another institution, the eye hospital of 1884. Now a hotel. 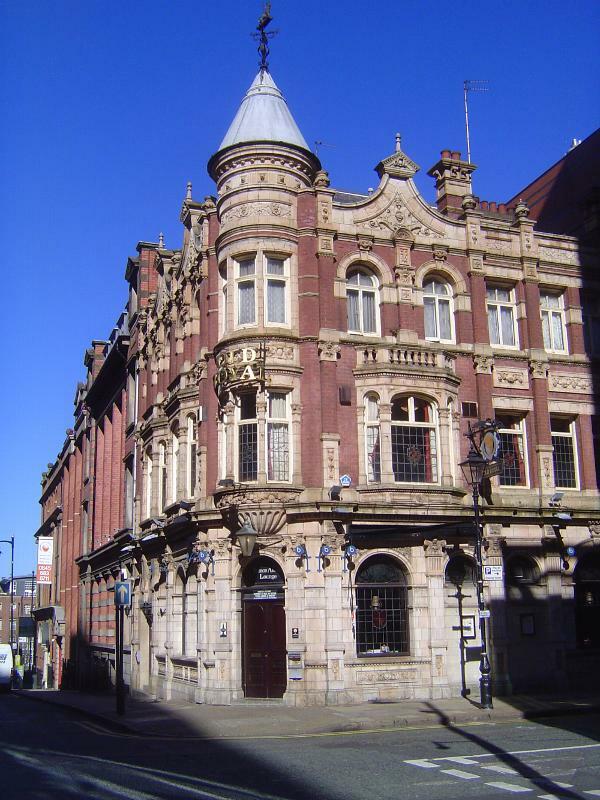 The lookalike Old Royal, originally the Red Lion, 1900. Behind all this display of wealth there was a world of factories and factory-hand accommodation. Some of the factories wasted little money on trim. 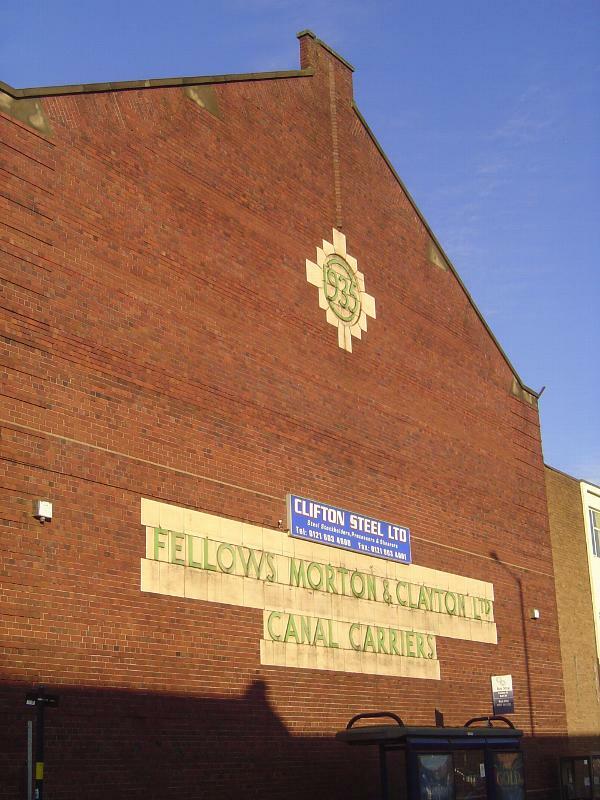 Such was the case with Henry Shaw & Sons, a firm that originally made nails, chains, and fasteners on Park Street, but which in 1908 moved here to a site on Birchall Street. The building seems to have been truncated, but all is not lost. 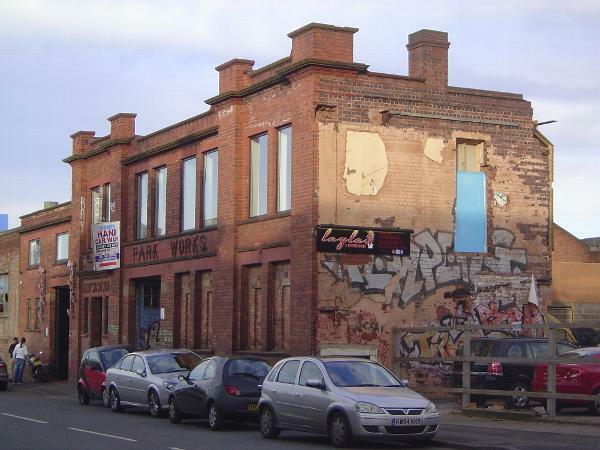 The upstairs was converted (over some community opposition) into a shisha or hookah bar in 2014. The other extreme: the "red palace," a landmark that began as H.B. 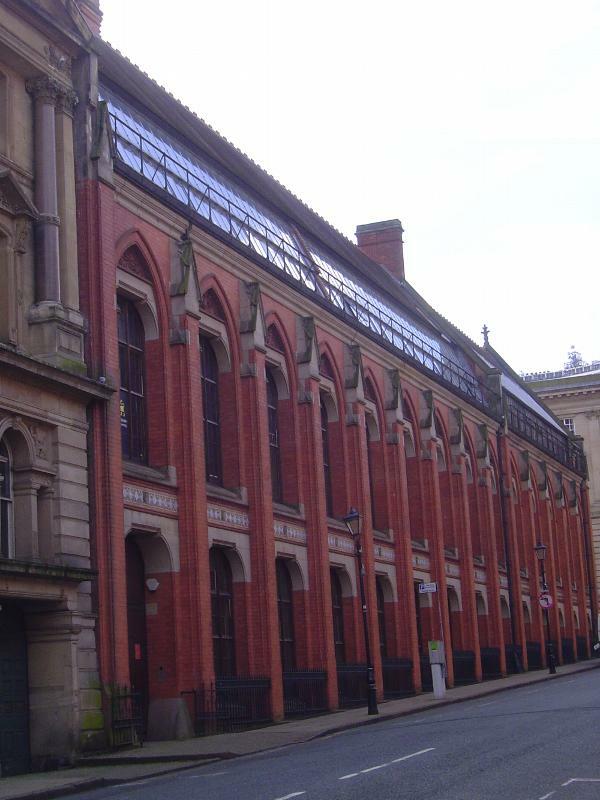 Sale's factory on Constitution Hill. 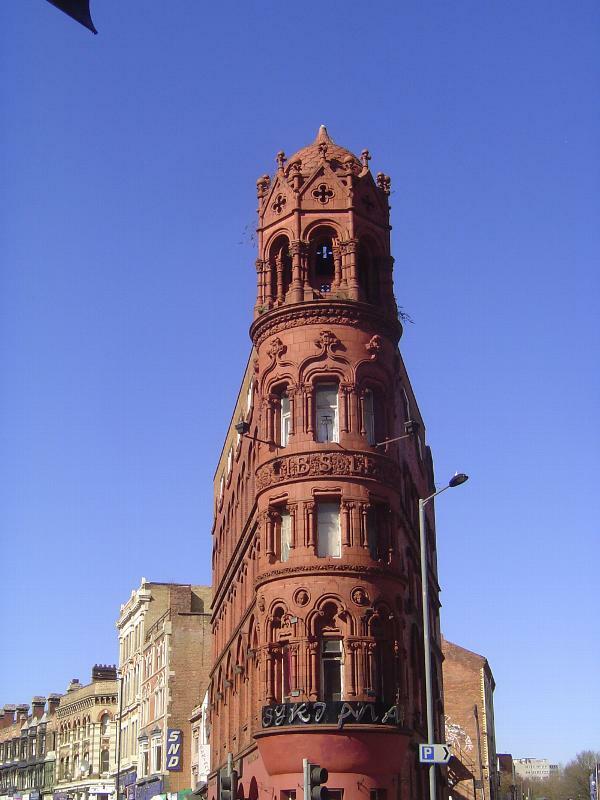 Sale's business was the manufacture of die sinkers, but somewhere along the way the building's very visible location gave somebody an idea and so the ornate tower was added as a memorial to Lord Roberts of Kandahar, who was still very much alive in 1896, when the building (and tower) were completed. The building has more recently been partly vacant and partly used by a restaurant. Another industrial establishment with a properly Victorian self-regard. Alfred Bird was the inventor of an egg-free custard still known as Bird's Custard. 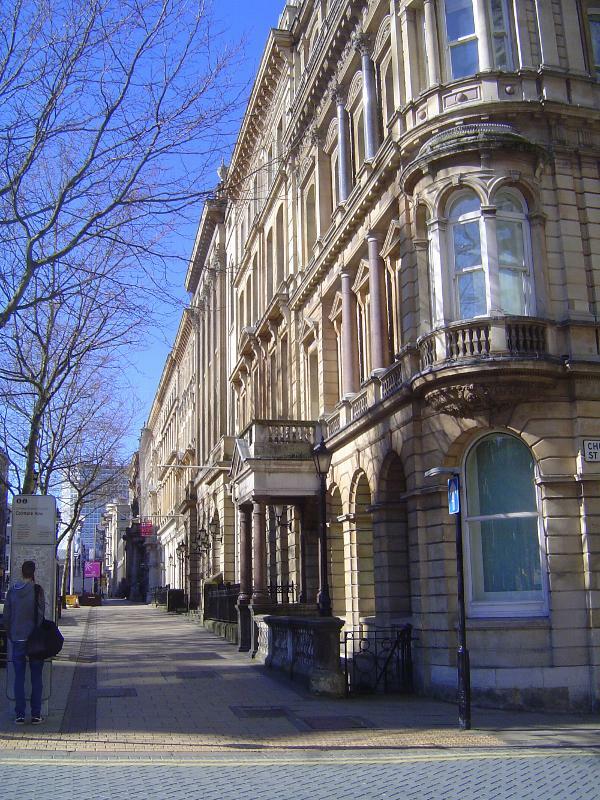 The company was sold to General Foods after World War II, and operations were moved to Banbury in 1964, but the old building survives as the Custard Factory arts centre. 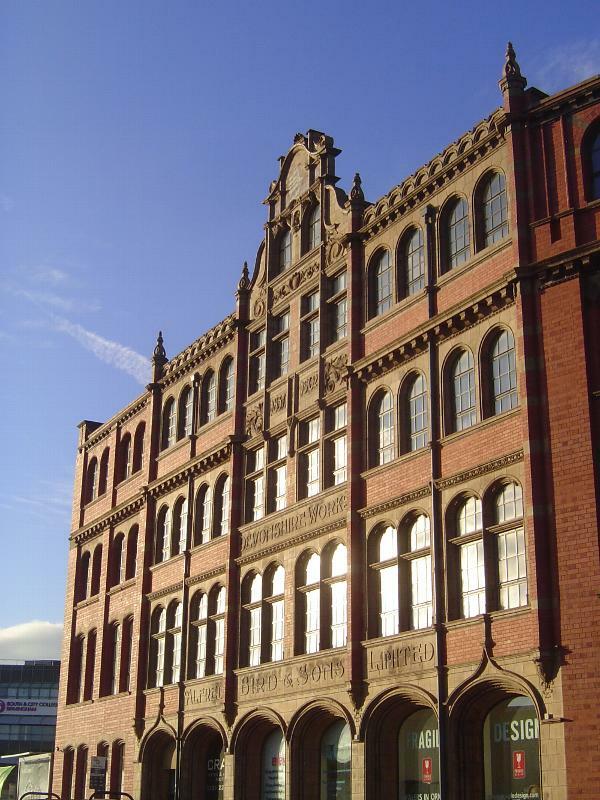 Lippincott's gazetteer of 1893 attempts to sketch in a single breath the breadth of Birmingham's industrial activity. The City's "manufactures comprise almost every description of iron and steel goods, brass and iron founding, saddlery, fire-arms, cutlery, gold, silver, plated, bronze, ormulu, and japanned wares, paper-mache goods, toys, jewelry, electro-plated goods, buttons, steel pens, glass, tools, steam-engines, and all kinds of machinery." Pity it overlooks custard. Another option was a room in one of the city's back-to-backs. 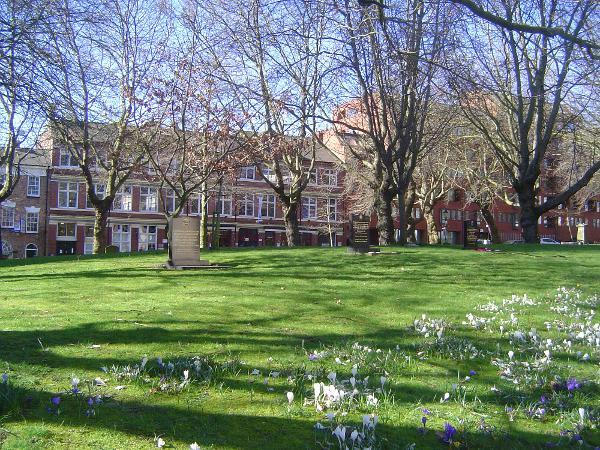 The last of them, shown here, is now protected as a museum. It stands in the form it assumed in 1821: three stories around a courtyard, with accommodations of a single room entered from a stairwell set into the corner of that room. There was no plumbing, only shared privies in the courtyard, along with a shared pump and laundry room. 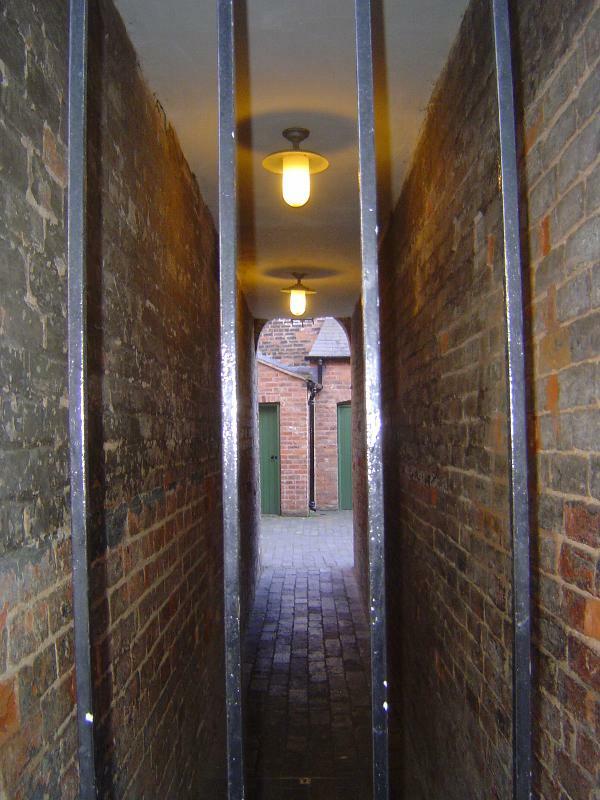 The name "back-to-back" comes from the fact that one set of rooms faces the street; another, the courtyard. Courtyard entrance, with modern lighting. 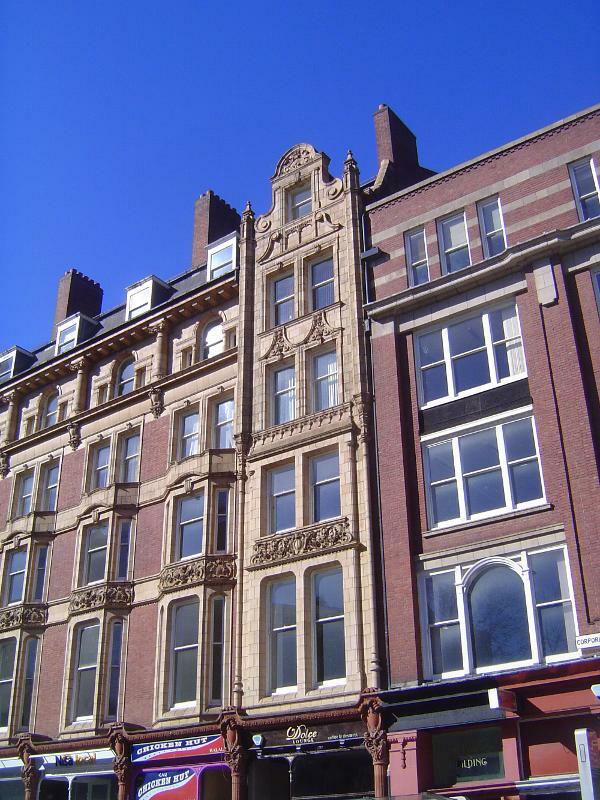 Birmingham had 20,000 of these tenements. New construction was banned in 1870, but this one was occupied until 1967. How were they seen in their day? The evidence is mixed, as you'd expect. 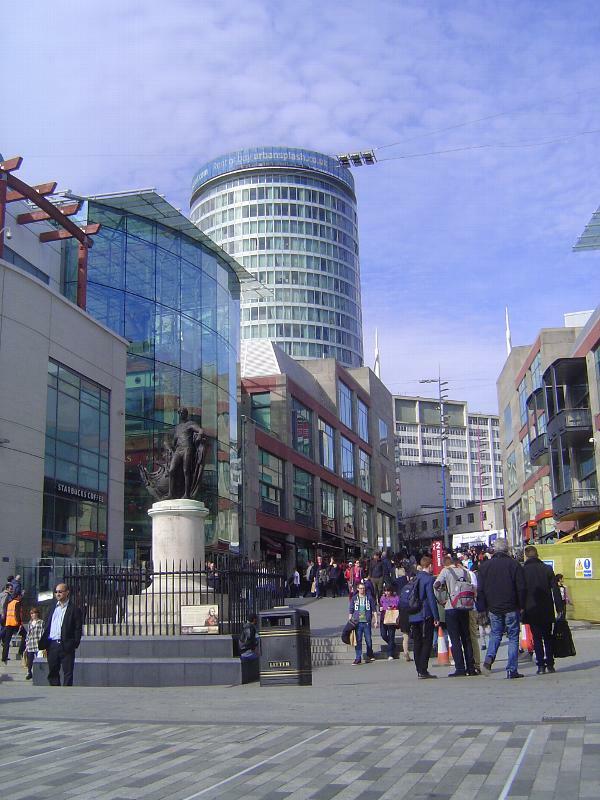 One observer wrote that "wages are higher in Birmingham than in most of the towns of the north of England; and the condition of its artisans is in favorable contrast to that exhibited at many other places, both as to health and prosperity." Time to celebrate. On the other hand, Joseph Chamberlain as mayor said in 1875, "We bring up a population in the dank, dark, dreary, filthy,courts and alleys... we surround them with noxious influences of every kind, and place them under conditions in which the observance of even ordinary decency is impossible; and what is the result? What can we expect of such a thing." 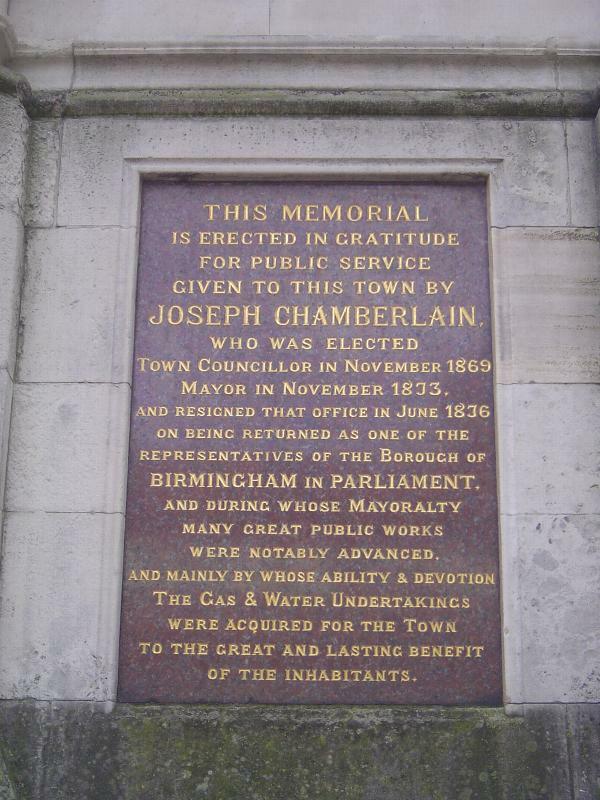 Here's the monument erected to Chamberlain in 1880, by which time he had moved onto the national stage. He was present at the dedication; good thing he wasn't around in 1974 for the opening of the library. Lost in the shuffle are a statue of James Watt, erected in 1868, and another of Joseph Priestley, recast in 1951. Both were moved here from other locations. 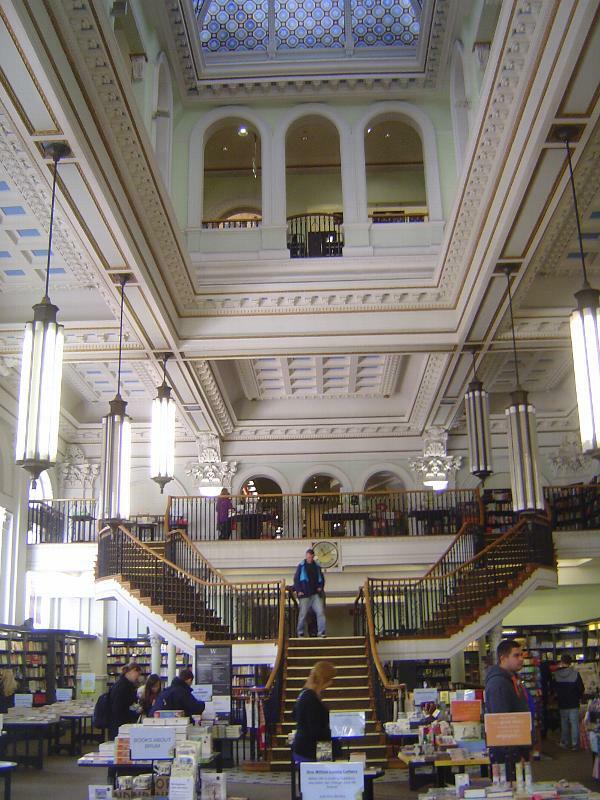 The library, by John Madin Design Group, does have its fans. 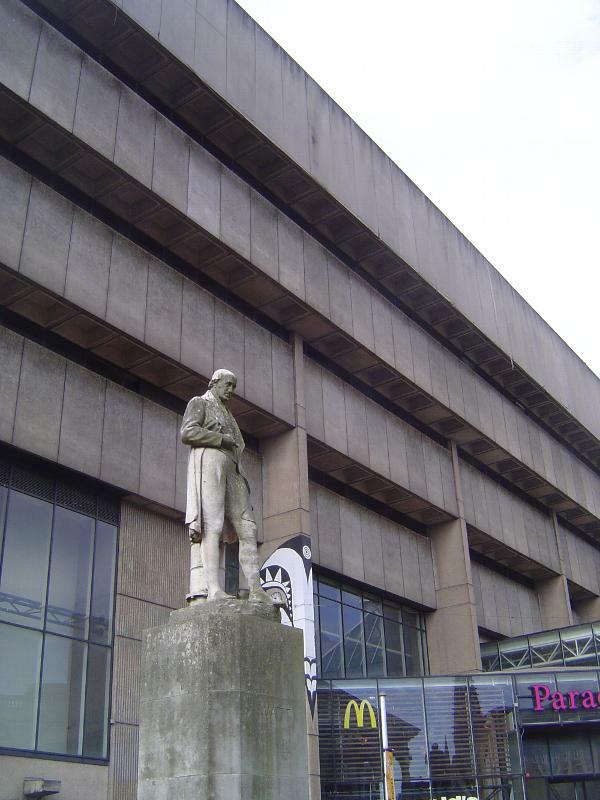 Foster calls it "a civic project of European importance" and "the finest example of the Brutalist aesthetic in Birmingham" (p. 77). English Heritage pushed to have the building protected, but the national government in 2009 declined the request. Late in 2015, demolition began. Watt stands in front of a steam-engine cylinder. He himself needs some TLC. A few blocks away and in better shape, Lord Nelson was put here in 1809 after a public subscription. The sculptor was the eminent Richard Westmacott, but the statue has lost most of its elaborate base and now stands surrounded by a shopping center. "All very depressing," writes Foster (p. 87). 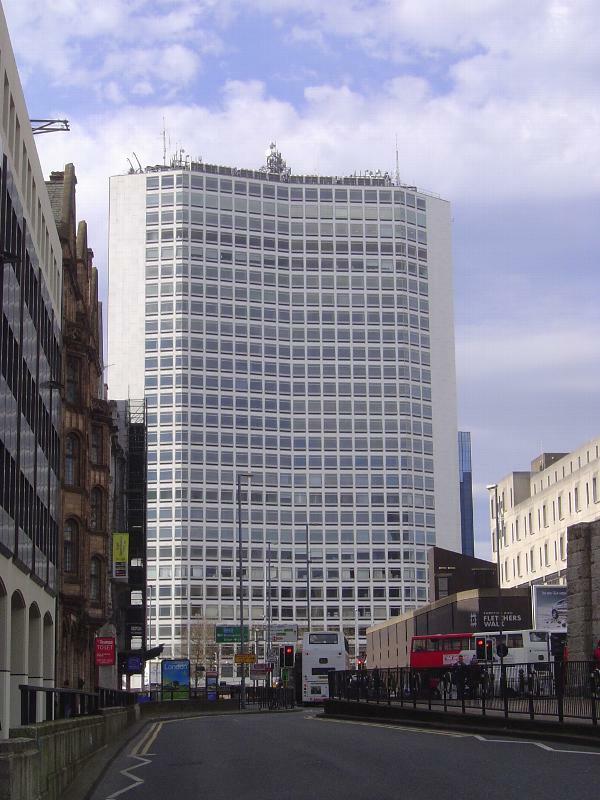 The 24-story Rotunda building by James Roberts is the only surviving bit of an urban renewal project of the 1960s. 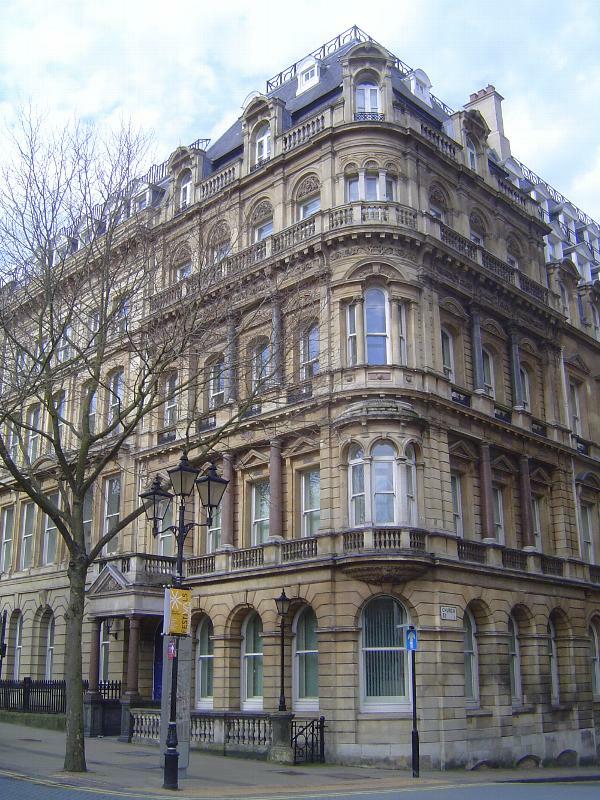 Originally an office building, it was reclad in 2004 and converted to apartments. The Bull Ring, adjoining the St. Martin in the Bull Ring church, is the historic town center, but it was demolished in the 1960s and again in 2000. 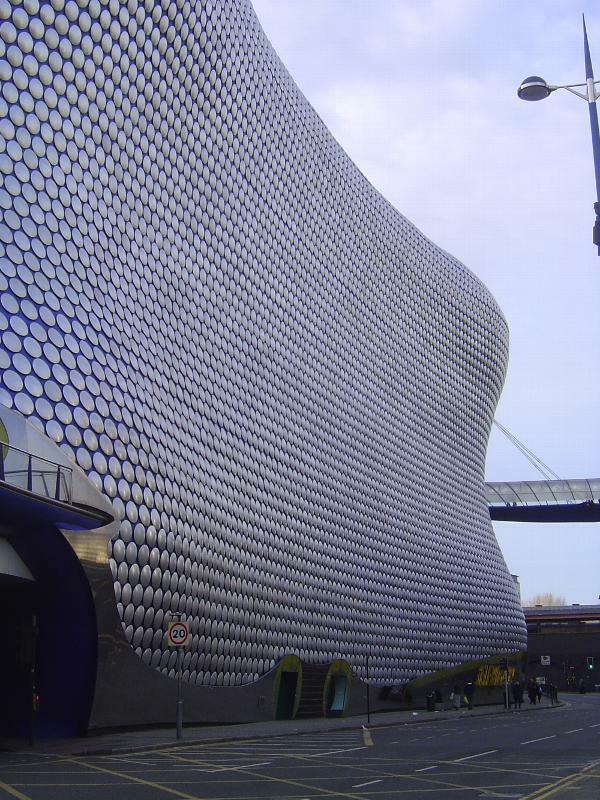 Enter Selfridge's, by Future Systems, 2001-3. Foster writes, "It is an appalling neighbour, because of its overwhelming bulk" (p. 88). The Alpha Tower, formerly ATV Tower, by Richard Seifert, was completed in 1973 and remains the city's tallest building. Impressed? I didn't think so. This'll rock your socks. 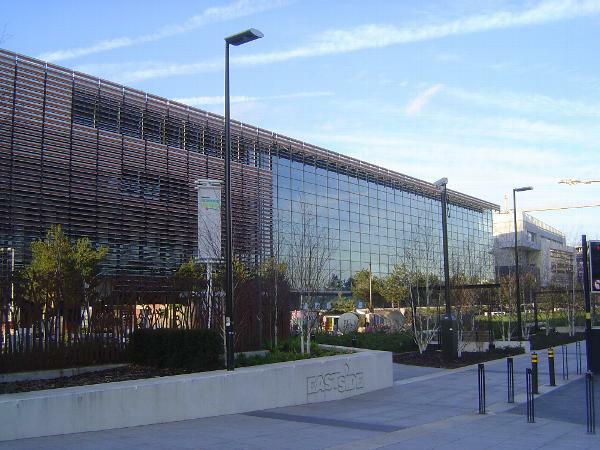 It's the city's new library, completed in 2013 and replacing the 1974 model. It's wonderful to see how much better architecture have become in the last 40 years. The cozy Millennium Point, 2001, by Grimshaw and Partners. Half the building is a museum of science and industry; half, space for local colleges. Grade A office space at 1 Snowhill. 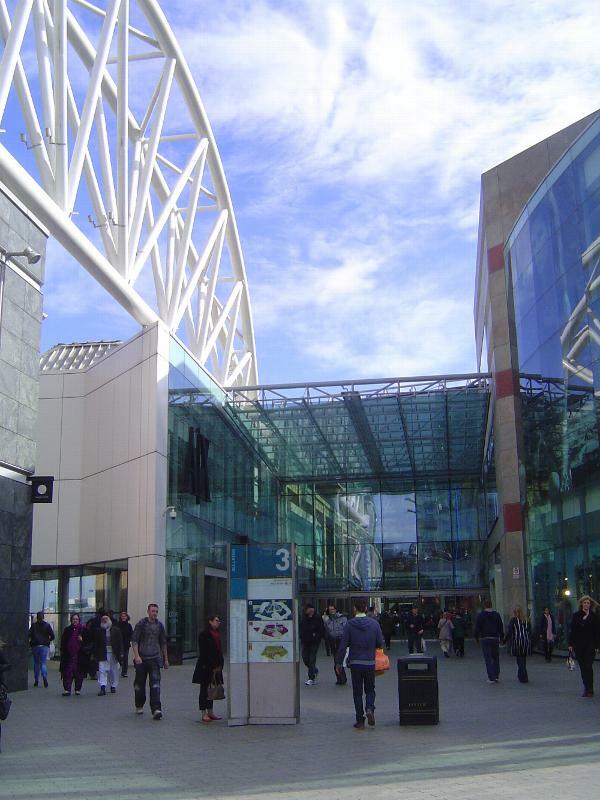 The building adjoins the Snowhill station, once the Birmingham terminus of the Great Western Railway. Who's leased space here? The usual suspects, including KMPG and Barclays. 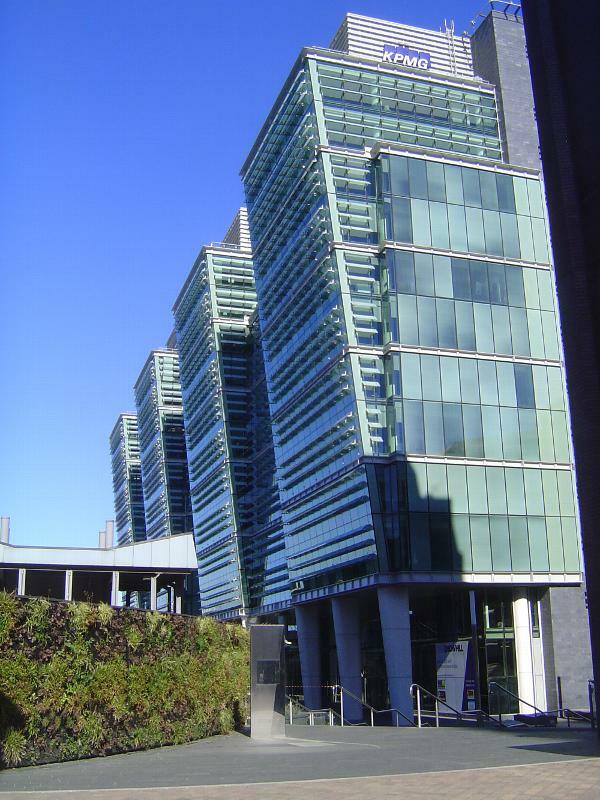 Promotional literature from Savills refers to "fully glazed facades, impressive reception, easily sub-divisible floor plates, dedicated breakout spaces, raised access floors, climate control and high levels of natural light." Where do we sign? 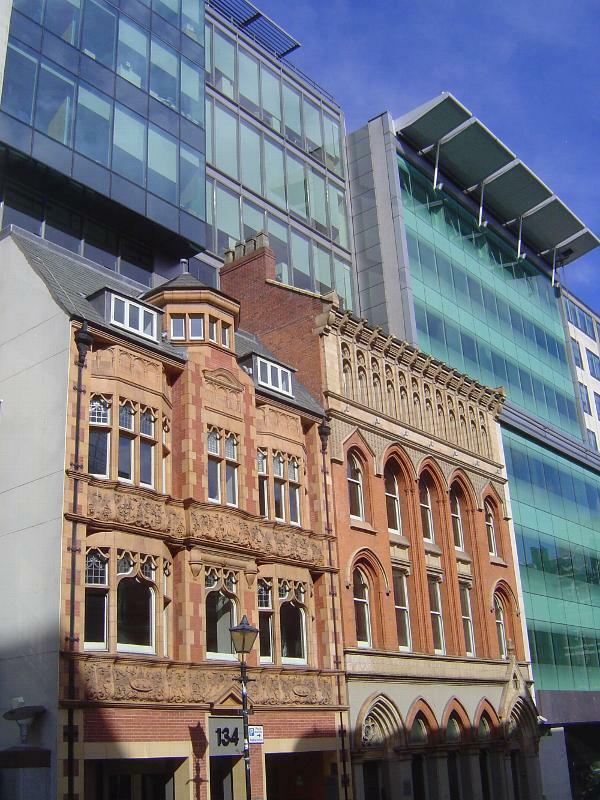 Cheek by jowl: the Eye Hospital, now the Hotel du Vin, next to the glassy building known as 45 Church Street and occupied mostly by Jones, Lang, LaSalle. Couldn't ask for a better example of facadism. 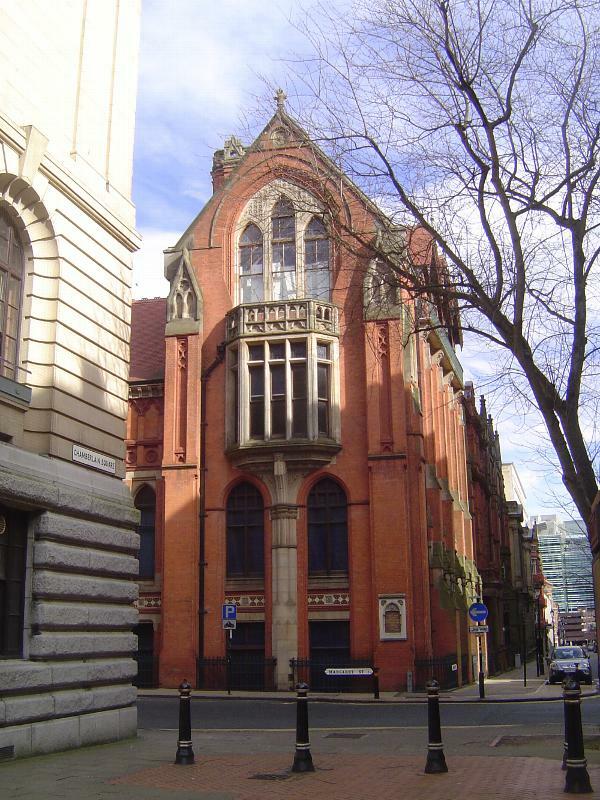 Here we are at 134 and 136 Edmund Street, the one Arts and Crafts, the other Gothic, the first from about 1900 and the second from about 1875; both are now reduced to skin for new office blocks. Want a breath of fresh air? 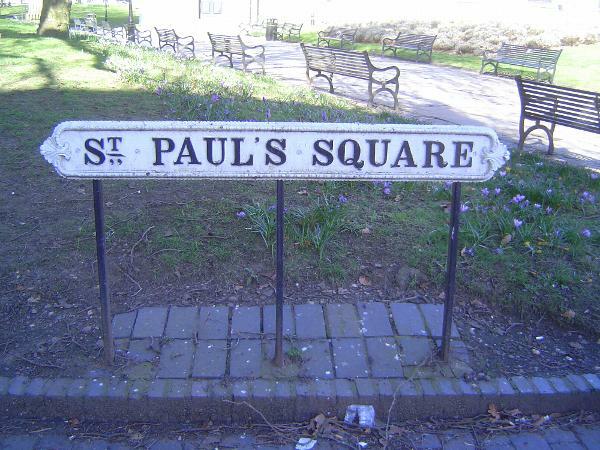 Try St. Paul's Square, just a few blocks away, though you have to cross busy Queensway without getting run over.